​Designed with the hard lessons of the North African campaign in mind, including the adoption of a dual-purpose gun capable of firing high-explosive and anti-tank rounds, the Cromwell was one of the most successful of the British cruiser tanks produced during WWII. The lack of heavy armor was made up for by the tank's high speed provided by a Rolls-Royce engine. The Centaur was externally almost identical to the Cromwell, the major difference being the installation of the less powerful Liberty engine. While the Centaur equipped the Royal Marines during the Normandy battles, the Cromwell served until the end of the war and formed the basis for the Comet. In his fifth book in the Tank Craft series, author and illustrator Dennis Oliver used official wartime photographs and comprehensively researched, exquisitely presented color profiles to tell the story of the penultimate British cruiser tank. In common with all the titles from the Tank Craft series, the large full-color section features available model kits and accessories as well as after-market products. In addition to the color profiles, there is a gallery of expertly constructed and painted models. A separate section explains technical details and modifications made during production and in the field, giving the modeler all the information required to recreate an authentic replica of one of the tanks that served from the Normandy beaches to the final battles in Germany. Dennis Oliver is the author of over twenty books on WWII armored vehicles, including Code name Swallow: British Sherman Tanks at Alamein; To the Last Bullet; Germany's War on Three Fronts, Westwall; German Armour in the West 1945; Viking Summer and A Sound Like Thunder. Pen & Sword Books us based in the UK. This book is soft-cover in 11 1/2" x 9 1/4" page format. 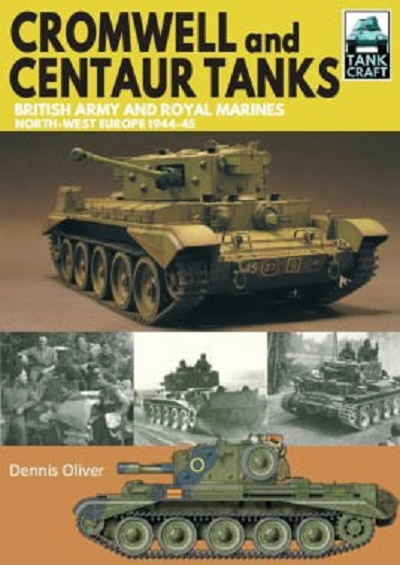 The cover art shows a color photo of a Centaur CS Mk. IV model built up from a Tamiya 1/35th scale kit by modeler Marcos Serra at the top. Below that is 3 wartime black and white photos and a color side profile of a Cromwell Mk. IV. There are 182 color photos and 40 black and white ones in the book. There is technical analysis and lists of modifications to the Centaur and Cromwell tanks. A illustration of the make up of a British Armoured Brigade, June 1944. A third illustration of the make up of the British Armoured Reconnaissance Regiment, June 1944. A fourth illustration of the make up of the British Regimental Headquarters. There are 29 unit insignia shown as patches and metals. Armourscale accessories in 1/72nd and 1/48th scale on various Cromwell kits. Hauler accessories in 1/48th, 1/35th and 1/87th scale on various Cromwell kits. Eduard Model accessories on a Tamiya Cromwell Mk. IV. S & S Models conversion set in 1/56th scale on Italeri's Cromwell kit to make an ARV version. RB Model accessories in metal in 1/35th scale for various Cromwell kits. Voyager Model upgrade sets in 1/35th scale for various Centaurs. The last page of the book has a black and white cover art of Pen & Sword's "Sherman tanks" British Army & Royal Marines, Normandy Campaign 1944 by Dennis Oliver. This book will be of great interest to both modelers and armor historians alike. I want to thank Casemate Publishing for this review sample and the folks at Pen & Sword.